Don't scramble for credit card details when purchasing tickets to an event, check out in just a few clicks with Visa Checkout. Visa Checkout is a secure and easy way to pay for your next Ticketek purchase. Register once then simply check out with a username and password each time. 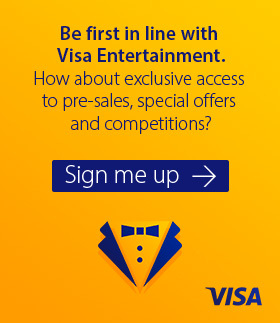 Visa Checkout stores all of your payment and address details securely online, so there is no need to re-enter your card number or address for every purchase making it even easier to purchase your event tickets on Ticketek.